Martyn Collins Digital and Social Media Marketing Services: Can TripAdvisor Transform Itself From an Industry Foe to an Industry Friend? Since its inception back in February 2000, TripAdvisor has become the world's largest travel site with over 50 million users, including 16 million mobile users. There is no doubt TripAdvisor was one of the pioneers of user-generated content. The website re-invented customer reviews in the hospitality space and inserted itself in the "last mile" of traveler's hotel stay planning and booking process. Obviously, a force to be reckoned with. TripAdvisor began trading as an independent public company on The NASDAQ Global Select Market on December 21, 2011 following its spin-off of Expedia, Inc.
Is TripAdvisor coming out of its divorce from Expedia as a winner or loser? Now that TripAdvisor is an independent public company, has it become more unbiased and industry-friendly? What does the future hold for the company in the midst of important changes in the industry and in travel consumer travel purchasing patterns? I would like to review some of the concerns I have about the business model, industry and traveler perceptions of the company, as well as its future. Google Reviews were introduced in early 2011 and replaced TripAdvisor reviews in Google Places. This has already made a significant dent in number of referrals from Google to TripAdvisor. All OTA sites have their own reviews, including Expedia's own "verified" reviews, which already makes TripAdvisor obsolete for many OTA loyalists. Major hotel chains and brands started introducing their own "verified" reviews, including Marriott and Starwood. All major hotel brands will follow suit in 2012-2013. Will brand-loyal customers still need to go to TripAdvisor? Popular dining review sites such as Yelp, OpenTable.com, etc. already rule the food & beverage scene. The social networks (Facebook, Twitter) - already rule the friends & family reviews. Years of tainted, non-verified reviews and "gaming the system" cases have put a dent in the credibility of TripAdvisor. Recently, as a result of the UK's Advertising Standards Authority's (ASA) adjudication regarding complaints against "claims on tripadvisor.co.uk," TripAdvisor was told "not to claim or imply that all the reviews that appeared on the website were from real travelers, or were honest, real or trusted." Hotels perceive TripAdvisor as being anti-industry, pro-OTA and one-sided pro-consumer. Remember the annual and much publicized "The Dirtiest Hotels List," abandoned by TripAdvisor only in January of 2012? For many years former-owner Expedia and other OTAs have dominated the site and still do through the "Show Lowest Price" booking options and the various advertising opportunities that are simply out of reach for small to mid-sized properties. Non-verified and obviously malicious customer reviews have ruined the sleep of many a property manager. Lack of a balanced approach and even an elementary "fair share of voice" algorithm when presenting the customer reviews continue to tarnish hotel reputations: you may have 100 excellent reviews and if you have 1 bad review, it gets prominently displayed on the first page of the hotel profile. The list goes on and on. TripAdvisor makes money not from its core audience, travel consumers, but primarily from click-based advertising (72%), display-based advertising (17%) and subscription revenue (11%). Back in the pre-Expedia days, TripAdvisor's business model was far friendlier toward small and mid-sized advertisers i.e. hotels. A property could buy an enhanced listing with a link to the property website for $99/per year. It could have a banner campaign for $1,000/month. What is the situation today? TripAdvisor's current business model is not suited for the highly-fragmented hospitality industry and could be perceived as anti-industry. The site relies heavily and almost exclusively on big OTAs and a handful of big hotel chains and advertisers. What are the advertising options for the 52,000 plus hotels in the U.S. or the 300,000 hotels worldwide? "Show Lowest Price" reservation widget, dominated by the OTAs. "Travelers Also Viewed..." list of competing hotels. CPC (Cost per Click) listings dominated by the OTAs and big advertisers. The is no doubt that the minimum-spend mandate per advertising campaign, whether click-based or display-based , is way beyond what any single property could possibly afford. At least I do not know of a hotel in the U.S. which can afford to spend $100,000 per year on TripAdvisor alone. The hospitality industry is highly fragmented. The bulk of the hotel advertising budget is controlled at the property level (not by the major hotel chains or brands, hotel ownership groups or hotel management companies). Remember what made Google the advertising powerhouse of today? Google's micro-campaign advertising business model & superb online self-serve campaign management technology unleashed a multi-billion dollar online advertising phenomenon by enabling thousands of small and mid-sized businesses to become online marketers and promote their services! Via Google AdWords, any advertiser - small or large - could launch a paid search campaign within a few minutes and with a budget as low as $100 or as big as $1 million a month! With thousands of hotels, which are all small and mid-sized businesses, where is TripAdvisor's micro-campaign business model and online self-serve campaign management technology to enable the highly-fragmented hospitality industry? Ever since the emergence of the "commercial" Internet back in 1995, there have been practices established to distinguish paid content from non-paid content on any website. This is the reason why when you go to CNN or FoxNews you see "Advertisement" under any banner advertising or "Sponsored Listings" above any click-based advertising (CPC). Official content: articles, descriptions, etc. User-generated content: customer reviews, comments, feedback, postings, etc. Advertising content: banners, sponsorships, CPC listings, etc. When reviewing any of the content pages on TripAdvisor, the user is confronted by a total content mish-mash. There are no "demarcation lines" between the advertising, official and user-generated content, which is against all existing user expectations and best practices in 2012. The main focus and the main revenue driver for TripAdvisor is the "Show Lowest Price" reservation widget smacked in the most visible part of the site. Needless to say this functionality is available only to OTAs and big hotel chains and advertisers who can afford the minimum spend mandates. You would expect that in 2012 this functionality - crucial to the well-being of the company - would offer a user-friendly interface and seamless integration with the central reservation systems of advertisers. So what happens when you click on the "Show Lowest Price" button? Six to eight pop-up reservation screens overwhelm the user and provide a true 1990s user experience. Compare this to the elegant user interface of the Kayak.com's search and availability functionality! Manual contracting process and campaign set-up make the set-up process obstinate. Advertisers deal with different departments to set up display-based and click-based advertising. As mentioned, there is no online campaign automation for sign-up and management for click-based advertising similar to Google AdWords. Decreasing ROAS due to advertising over-saturation (CPC, Show Lowest Price, Banners, Business Listings, AIM Links, etc.). No real-time control over daily budget spend. As already discussed, there are no micro-campaign opportunities for small and mid-sized campaigns (read: hotels), the "Show Lowest Price" functionality is available only to OTAs and big hotel chains and advertisers, and the minimum spend mandates (click- or display-based) are prohibitive. So what is the situation today, more than 45 days after TripAdvisor's spin-off? I truly expected that after its "liberation" from Expedia, TripAdvisor would try everything possible to repair its strained relations with the industry. It would embrace the industry and send a strong, unequivocal message to hoteliers: "I am no longer an OTA subsidiary and I am an industry friend. I am now part of the direct online distribution channel and I am on your side. I will work with you to understand your need periods and help whenever possible. I am unbiased and will work with you to improve the quality and credibility of customer reviews and help you address customer concerns. I will help you reach travelers interested in your destination and in your hotel." None of the above happened. TripAdvisor did nothing to pacify or smooth out things with the hospitality industry. No press releases with an "I am a hotel-friendly media company" message. It did not sponsor industry events. It did not announce scholarships for hospitality schools. Many hoteliers do not even know that TripAdvisor is no longer associated with the industry's "Villain Numero Uno," Expedia. In other words, business as usual. So what does the future hold for TripAdvisor? I have followed TripAdvisor from its inception. I have admired their pioneering role in user-generated media. I have really hoped that TripAdvisor would transform itself into a hospitality industry friend after its spin-off from Expedia. Unfortunately, today TripAdvisor is still a foe of the industry. TripAdvisor has to make a clear choice today: continue their anti-industry, pro-OTA and one-sided pro-travel consumer policy and business model; or dramatically change its corporate attitude toward the industry and business model. 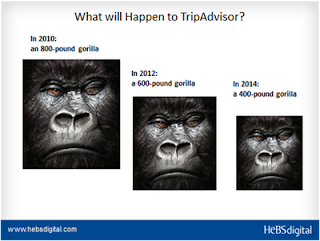 TripAdvisor needs to transform itself into an industry friend and it needs to do this fast. It needs to overhaul its business model and make the site industry-friendly and advertiser-friendly. It must dramatically improve its perception in the industry and site usability, and invest in online self-serve campaign management technology to enable micro-campaign management for the highly-fragmented hospitality industry. The "Show Lowest Price" functionality must have a better interface with the CRS-s of its advertisers and open it to smaller and mid-sized hotel companies, independent hotels and resorts. If it fails to do that, in my humble opinion, TripAdvisor will end 2012 more like a 600-pound gorilla and by 2014 will be reduced to mere 400-pound-gorilla status. Click here to read the entire blog article on HOTELSMag.com, as well as a full selection of Max Starkov's blog articles on hot industry topics and latest trends in the online channel in hospitality (FREE registration required).